Elizabeth Sprague, small business coordinator, of the Downeast Business Alliance talks with Clayton Blake of Cooper about a recent $123,000 grant that will enable Blake to expand his custom butchering facility into the only state-certified slaughterhouse in Washington County. Sprague wrote the grant to FAME that Blake obtained last week. "This project is entirely consumer driven," Sprague said. The project not only allows Blake to complete a major expansion, but will allow many Washington County farmers to expand their livestock operations. ALEXANDER, Maine — Economic officials say they cannot measure the importance of a state-certified slaughter facility in Washington County to farmers there and in southern Aroostook County. “People were holding back,” Elizabeth Sprague, small-business coordinator for the Down East Business Alliance, said. Because the closest inspected slaughter facilities were hours away and livestock are seriously stressed during transport, many Washington County farmers limited the number of animals they raised in spite of heavy demand for local meat. 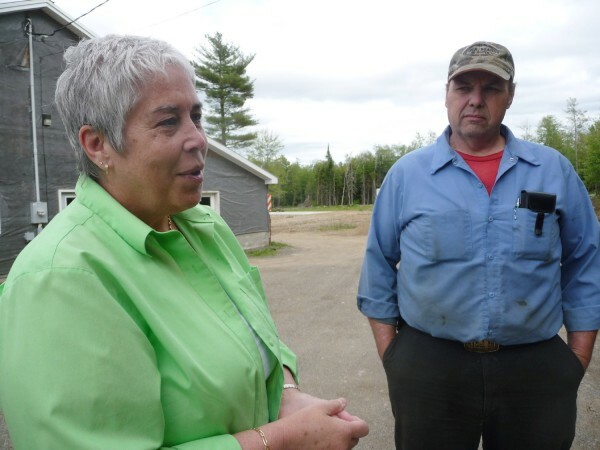 That should all change by this fall, however, as Clayton and Catherine Blake of Blake’s Slaughtering and Custom Meats in Alexander recently obtained a $123,000 grant from the Finance Authority of Maine to invest in a major expansion of their facility. The closest federal or state inspected facilities to Washington County and southern Aroostook are in Guilford, Medway and Charleston. Previously, the facility only custom-slaughtered animals for private use and not for public resale. Not only will the expansion mean up to seven new jobs at the slaughterhouse, but it will enable area farmers to grow, Clayton Blake said. Sprague, who wrote the FAME grant application for the Blakes, completed an infrastructure study in 2007 that showed, among other things, that livestock producers were holding back on the size of their meat and poultry operations because there was no state or federally inspected slaughterhouse in Washington County. Because this project starts with an existing building, equipment and an established, well-known business, the total start-up costs are a fraction of what it would take to start a processing operation from the ground up, Sprague said. Mobile slaughter units begin at nearly $400,000, she said, and a new brick-and-mortar facility would easily run $1 million. Blake said he will use the grant funds to revamp the existing facility, install a smokehouse, expand the processing areas and create a composting system for offal. The existing slaughterhouse will double in size to more than 2,000 square feet. Building should begin in three weeks and be completed by September. The slaughterhouse is in a Pine Tree Zone, which will enable Blake to take advantage of benefits such as lower taxes on certain equipment and benefits for training his employees. Blake said Unity College is installing a 100-foot-tall windmill as a demonstration project and to test the winds on Breakneck Hill, where the facility is located. “If I eventually purchase the wind turbine, I can get 10 investors to tie in and we can all reap the benefits,” Blake said. Blake said he hopes to build a separate poultry processing facility next year, which would result in an additional two or three employees. Blake said he fosters an attitude of treating “that animal the way you would treat your own animal. You maintain respect.” He began custom slaughtering when he shot his first deer at age 13 and his father made him dress it out himself. Last year, Sprague assisted the Blakes in obtaining a new freezer-storage unit as part of Down East Business Alliance’s StoreMore project which was funded by the U.S. Department of Agriculture. “Gaining grant support was necessary in this case because of our location in Maine and because loans and traditional funding options would have saddled the business with risks that Clayton was unwilling to take,” Sprague said. Blake said that becoming state certified will allow him and other livestock producers to sell their meat within the state of Maine. Rules were adopted just a month ago under the U.S. Farm Bill of 2009 to expand state inspection programs so farmers also can sell out of state, but Dr. Henrietta Beaufait of the Maine Department of Agriculture said the state has no training funds to participate. Maine would have to adopt a policy similar to the federal policy and would need to send its field inspectors for a three-week training session in order to allow interstate sales, Beaufait said. As the supervisor, Beaufait’s training would take nine weeks. Maine now has four state-certified meat inspectors, Beaufait said. Although Beaufait said that not participating in the program stifles Maine farmers’ ability to grow, the state has not actively pursued compliance.